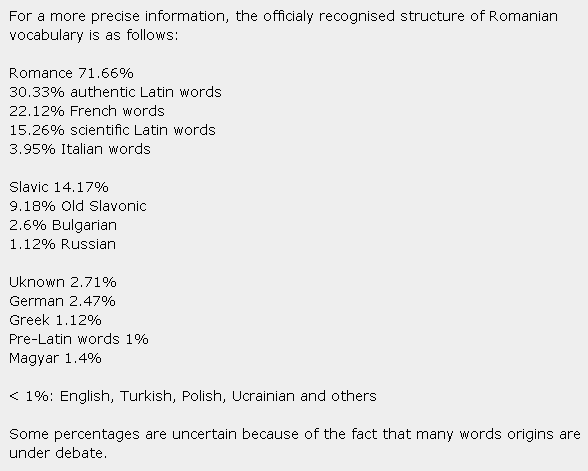 Page F30: Romanian vocabulary - how much from Latin, Romance, Slavic, other languages? Romanian vocabulary - how much from Latin, Romance, Slavic, other languages? Според друго изследване, румънската лексика съдържа 71,66% латински елементи (от които само 30,33% са собствени, а останалото е адаптация предимно на френски, латински и италиански думи), 14,17% славянски (български или руски) елементи, 3,91% собствени румънски словосъчетания, 2,71% думи с неясен произход, 2,47% немски думи, 1,7% новогръцки адаптации, 1,43% унгарски адаптации, 0,73% турски думи, а останалото е от дакийския език. Translation: According to another study the Romanian lexicon contains 71.66% Latin elements (of which 30.33% are from Latin, while the rest is composed primarily of French, Latin and Italian words), 14.7% is of Slavic (Bulgarian and Russian) elements, 3.91% independent Romanian phrases, 2.71% words of uncertain origin, 2.47% German words, 1.7% modern adaptations, 1.43% Hungarian adaptations, 0.73% Turkish words, and the rest is from the Dacian language. Making a quick assumption that the average fluent speaker would understand about 10,000 -- 20,000 words in a language, (this number also depends on how you define a word), that means learning Romanian to fluency would give one a knowledge of some 1500 - 2500 Slavic words. 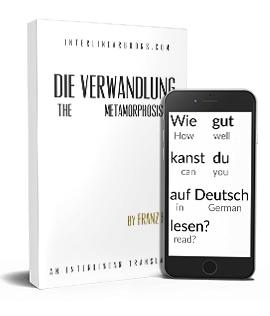 In English a knowledge of 1000 words gives 72% written text coverage, 2000 words brings it to 79.7%, and by 3000 you're up to 84% comprehension. In short, learning Romanian with particular attention to words of Slavic origin will go a long way towards any Slavic language you intend to pick up later. What Romanian won't bring you, of course, is familiarity with the Cyrillic alphabet. 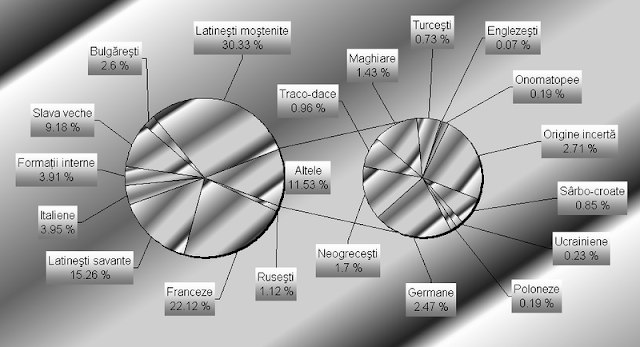 The two Slavic languages with the strongest influence on Romanian don't use the Latin language, and the closest one to them that does use the Latin alphabet is probably Serbo-Croatian when written in the Latin alphabet, being a South Slavic language with vocabulary (but not grammar) similar to Bulgarian. For more on this in Romanian, see here. A number of other studies have been conducted that produced about the same results.